Twenty-six Years of Superior Engineering. Machine designs to fit your needs. In twenty-five years, we have learned much about building machinery. We make it our highest challenge to continue refining and perfecting our designs and technologies to better serve you, our customers, in your ultimate goal: Growing your business. 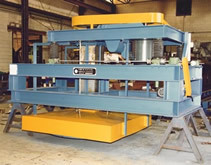 With our standard machinery lines, you are sure to receive the highest quality equipment built to your specifications in the shortest amount of time possible. From a radial arm polisher to a 5-axis CNC saw, we have a design that will fit your business' exact needs. Let us know exactly what you are looking for and we will contact you shortly with specifications and pricing on the units that you are interested in. If you are needing something a little out of the ordinary, our custom design services may be the ticket. From a one-of-a-kind cut-off saw to a thirty blade reciprocating multiplex, we have designed custom fabrication solutions for some of the biggest names in the stone, concrete and metal industries. Whether you have a unique product or just want to have the most efficient process available, our service may be able to save you in labor costs while optimizing production outputs. Tell us more about your unique product or process and find out how we can help your company save money and grow your business. We will discuss your options and present you with a solution that will optimize your process' production capabilities. Take a look at some of the custom solutions that we have built for our customers. Why Lease? Leasing can be a practical solution for business owner looking to hang on to their working capital. While we work with any leasing agent, we do have companies that we prefer to work with due to their knowledge of the industry and how we do business. These companies can be a valuable help in deciding how to finance your next machine purchase. Let us know if you are interested in leasing your machine and we will be sure to get you in touch with the company that will best suit your business. Want to get pre-approved? Fill out a leasing application and contact Dan Pitts with One Source Capital at (877) 848-4672.